Career Link is an exciting educational opportunity that will prepare you for a successful career by taking college courses while in high school. Career Link provides credits to meet your high school graduation requirements, as well as requirements for two- and four-year degrees. All tuition and textbook fees are paid through an agreement between your local high school and North Iowa Area Community College. 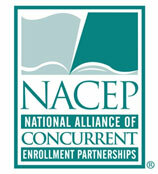 National Alliance of Concurrent Enrollment Partnerships (NACEP). This accreditation demonstrates that the Career Link program meets or exceeds rigorous national standards of quality in the areas of curriculum, instructors, students, assessment, and program evaluation.